"The list is displayed in Standard view. 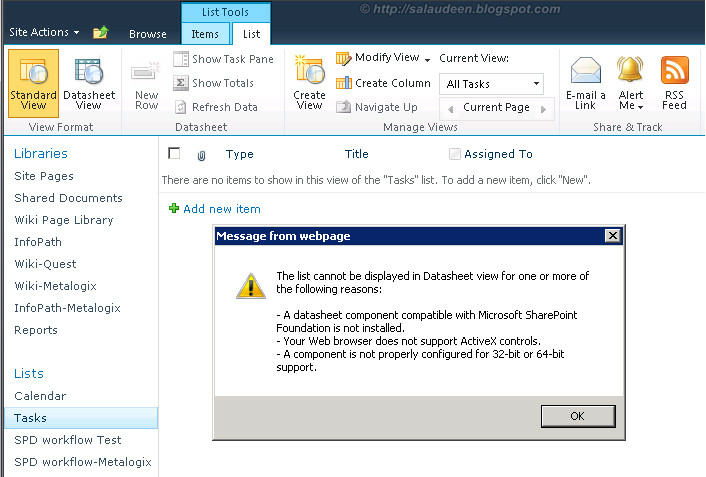 It cannot be displayed in Datasheet view for one or more of the following reasons: A datasheet component compatible with Microsoft SharePoint Foundation is not installed, your browser does not support ActiveX controls, a component is not properly configured for 32-bit or 64-bit support, or support for ActiveX controls is disabled." First, you need to have an Office installation in order to use the datasheet view. Yes, You may have Ms-Office installed. but the Edit in Datasheet view functionality is not supported if you install 64-bit Office 2010. However, the functionality is available if you install 32-bit Office 2010. The ActiveX control needed for the datasheet view is incompatible with the 64 bit version of Office. Worked perfectly; this was very helpful.